What do makeup artists do? Can you turn yourself into a monster on Halloween? On Halloween, you're sure to see all sorts of monsters. Some monsters are living legends, such as Dracula. Others are monstrous animals, like werewolves. Still others are manufactured in dark, dank dungeons. For example, most kids know who Frankenstein's Monster is. He wasn't a monster until a mad scientist, tinkering in his laboratory, brought him to life. The rest, as they say, is history! Making monsters might seem like simply the stuff of movies. In fact, it is, but it's also so much more than that. Many people make an entire career out of making monsters. We call them makeup artists! If you've ever seen a scary movie, you've probably seen the work of makeup artists. Of course, many modern movies rely heavily on computers to create their special effects. We call these effects computer-generated images or CGI. Some moviemakers, though, prefer to use real people in their movies as much as possible. If you want an alien, for example, and you don't want to use CGI, then you'll need a very talented makeup artist. Makeup artists have a long and storied history in Hollywood. Boris Karloff played the monster in the 1931 film version of Frankenstein. Long before computers, makeup artists turned Karloff into one of the most famous movie monsters of all time. It wasn't easy, though! 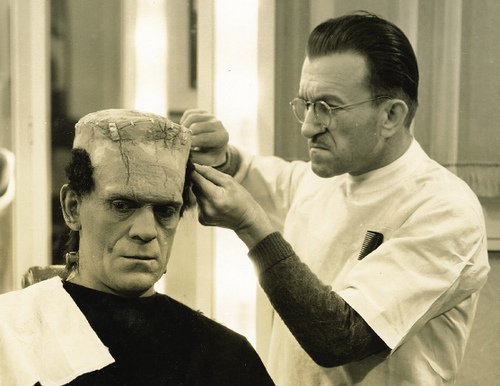 Before shooting could begin each day, it took makeup artists almost four hours to turn Karloff into a monster. After shooting was done for the day, it took another three hours to remove all the makeup! Making movie monsters by hand using makeup and other special devices can be time-consuming. Besides makeup, artists use all sorts of other items, including false teeth, fake blood, and plastic appendages called “appliances." Many actors don't mind spending hours getting made up, because they believe it helps them play their roles more convincingly. Actor James Hong played a character named Lo-Pan in the movie Big Trouble in Little China. His old-age makeup took a whopping eight hours to apply and consisted of a dozen overlapping layers of makeup and appliances! Today, Hollywood's top makeup artists are in high demand, just like the best actors and directors. Those who perfect their craft can have a long and successful career making monsters for your favorite movies. Don’t blink or you’ll surely miss tomorrow’s Wonder of the Day! What types of makeup are there? Find out! Ask an adult friend or family member to take you on a field trip to a local store that carries makeup. Check out the variety of makeup available. How many different types of makeup can you find? What is each type of makeup used for? If you can, purchase a couple of different types of makeup to try at home. Can makeup artists really change an actor's appearance that much? You bet they can! If you don't believe it, all you need to do is jump online and browse through the photos at 16 Images That Prove Just How Much Movie Makeup Can Change an Actor's Face. Which transformation do you think is the most dramatic? Want to go beyond the simple Halloween costume this year? Use makeup to transform yourself into a monster of your own unique creation! Sketch out a plan for what you want to look like. Then ask a friend or family member to help you with the process of transforming into something ghoulish. You may need to head to the store first to get a few supplies, such as makeup, fake blood, or even an extra eyeball. Have fun! Wow so funny!😂 Do you think you can do more Halloween wonders? Have you seen Wonder 1776: Do Other Countries Celebrate Halloween? We hope that this Wonder wasn't too scary for you, Nicole! If so, we're sorry, and we have many other Wonders to explore that aren't as scary! We hope this Wonder helped you find the answer!!! This is interestingly boring! I found it OK though. Even though this Wonder wasn't your favorite, we have plenty more Wonders of the Day for you to discover!! Thanks for WONDERing with us, evan! Did you check out the video above in the article? Or do you want a video of us turning into a monster (which also sounds cool)? Yes, tots adorbs! Sooooo cute! Glad you enjoyed it, Geeky Girl! Thanks for checking out this Wonder! Do you plan on making a monster? Wow I never knew that about frankinstin but I liked it to see how they did it back then! not that educational but super fun to read. why do we need to breath Hi my name is Nishita today is my friends birthday . I just learnded that Borris Karlof is the one you played the frankenstein in the movie Franfenstein. I didn't know that it can actually take four hours to do someones makeup! I'm being billy from dead silence on Halloween and my aunt is doing it. It is a lot of makeup. She's not a makeup artist but she's the best I know. It was really cool and she did a good job. I didn't get a chance to show her the wonder because she was doing my other aunts makeup but it's okay. Thanks for replying back I didn't think you would. On a side note are you a boy or a girl? Hi everyone my name is Danny I just started! man, frankenstein was wearing makeup,ha. I wonder how you made it look so real! I feel like those artists are not only great with makeup! how much make-up dose it take to make zombie. i love the stitches. How did you make them. My question: how do they make ghosts without CGI or real people showing? The answer: they put a person under the stage and projected a shadow onto a mirror to reflect it on stage. Can you even make a monster? I loved this article it is interesting how much makeup it takes to make a monster. I loved the article. is the makeup cover the whole Intire face? We Learned that Sometimes the Characters Are Real People Just With Make-up on them. I thought it was really helpful and cool. Thank you for helping me WONDER about what should be for Halloween. How do you make a big monster? Shouldn't you guys add that into it. It would be a lot more helpful. is the monster real or fake?? I did not love it but it was interesting. monster kinda scare me now because in the dark you see the scarier shadows in the night when you have your own room so it's scarier. That was so weird the monster really came alive at the end that was GREAT!!!!!! Well I do dress up for Halloween but I don't have a favourite costume. I did not really like that video. This video would really help me with my Halloween costume and a costume party any ideas on what I should be? It would really help if you gave me some ideas thanks. Hi I'm Kennion and I think this video is very funny. Keondre thinks this is the best video and you should make more. The video was really funny and even my mom said so too. It was so funny we couldn't stop laughing for 5 minutes. I think you should make more videos like this one. Plus I'm from Mrs. Atkinson's class and we also saw it. It was so funny that my class couldn't stop laughing and we all had to drink water. The video was funny and cute the little boy is pretending to be frankenstein's maker. I liked all the things in it. I am in school and we are talking actually right now. I am in Mrs. Hess' class and we love the wonders. Even my teacher likes it. This website is a really cool website. I really don't want to wear the makeup this Halloween. Do do you just have that stuff at your house like in Frankenstein? Yes I know how to do an evil laugh. I really like this one but you guys should really start to put some more things like this up and tell us who is the best artist in the world but that is more of an opinion. My favorite painting is Mona Lisa. That was soo funny we couldn't stop laughing I love that video. Hey that is a cool post I made a cool costume this it was a vampire with 3 eyes. Not that good, doesn't everyone know that? It was the most wonderful and cute video I have ever seen! You shoud make more! I loved your video and it was the BEST video I have ever seen! Net smarts has a robot. My brother and sister loved the video. Thank you for writing a lot of comments back to my class and my teacher is Mrs. Thomas. Aloha Wonderopolis! Can you really make a robot/monster. Hey I am about to make a monster by myself. That was really funny! I really liked it I thought the clay mation was really cool. I AM A... VAMPIRE PRINCESS!!!!!!!!!!!!!!!!! I AM SOOOOOOOOOOOOOOOOOOOOOO... COOL!!!!!!!!!!!!!!!!!!!!!!!! Happy Halloween! This year I'm going to be a hippie chick. Love the article. Peace out. Mustaches rule. We thought today's wonder was a little scary. Kinda freaky, yet awesome. The majority of kids polled in our classroom thought it would be spooktacular to be made up as Frankenstein or some other monster. We think tomorrow's wonder will be about seafood restaurants, kinds of fish, fishing, giant fish tanks full of fish, boofish, or maybe even scuba divers...dressed up as fish?? Happy Halloween! We liked the video today! We think tomorrow's Wonder might be something mysterious (fishy) or maybe about real fish! Thank you for putting up wonders of the day! From Catie! Have a spooky Halloween! Actually, the monster's name wasn't Frankenstein, the doctor's name was. The monster didn't have a name. We liked your Frankenstien. We really liked the stitches and eye-balls! It was funny when the boy started laughing in his imagination and he said "awwww", when he realized that he was still in his room. We liked how he used his imagination in his room, pretending he was in a laboratory and then when his mom called him, it really came alive! We learned that it takes a LONG time for them to do make-up. It was amazing to learn that they have to put on so many layers of make-up and it was cool how they can add appendages! It was cool to learn about Boris Karloff... It is neat to learn how they convincingly make the monsters look realistic. It must be hard and take real talent to make the monster look so detailed. We LOVED the video and we want to try some claymation, too! Hi Wonderopolis today I had no idea that Frankenstein was a history. Good Halloween morning, Wonderopolis! Our favorite part of this Wonder was the video. We enjoyed the part where the kid used the Poptart for the brain. We were also amazed that someone would spend 7 hours putting on and taking off make-up for a movie. Are you having a Horrifying or Hilarious Halloween at Wonderopolis? Our dads can help us make monster costumes. Are all monsters scary? We liked the clay-mation film. How many shots comprise the film? bcunning generous idols Not Quite! ccartoon general ideas Not Quite! dcrafty generic images Not Quite! Who played the monster in the 1931 film version of Frankenstein? Which of the following is not likely to be an item used by makeup artists? aplastic appendages called “appliances" Not Quite!